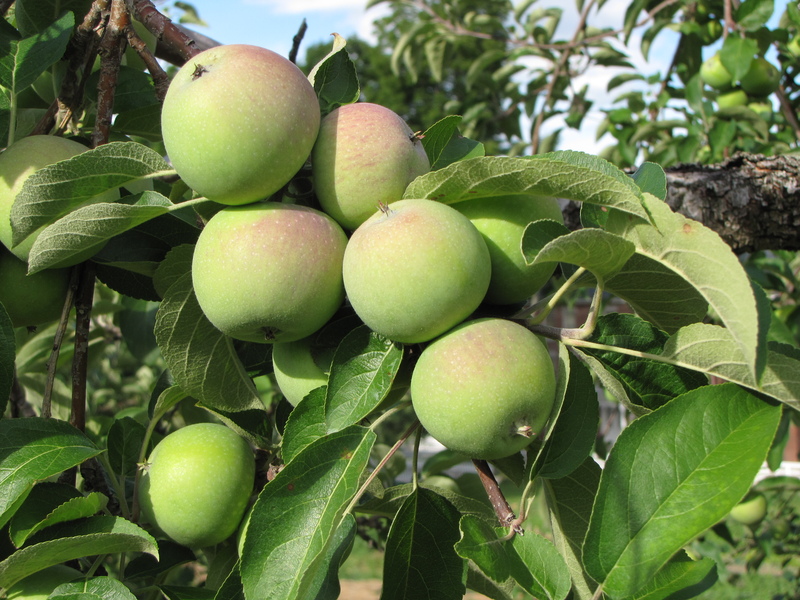 AN EARLY SPRING BLOOM followed by a hot summer means early apples in New England, beginning with varieties like Ginger Gold, Jersey Mac, and PaulaRed. The crop is running one to two weeks ahead of schedule in many locations, meaning that PaulaReds are already available for picking, and McIntosh could be ready as early as Labor Day weekend. Check your orchard’s listing and click through to their website at Find a New England apple orchard to see where they are available. 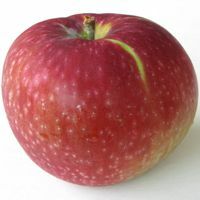 PaulaReds are striking, red in color with light yellow or green striping and prominent lenticels, the tiny dots on an apple’s skin through which it respires. PaulaReds have a sweet-tart flavor with a hint of strawberry. Their flesh is white, firm, and slow to brown. They are good for both cooking and fresh eating. PaulaReds launch the fresh harvest but they are not available for long and should be eaten soon after picking, as they do not store well. PaulaRed is a relatively new variety, discovered in Sparta Township, Kent County, Michigan in 1960, by grower Lewis Arends, who named the new variety after his wife, Pauline. PaulaReds came from a chance seedling near a block of McIntosh trees, and their sweet-tart flavor and two-toned color suggests they may have McIntosh in their parentage. Here is a cool summer recipe featuring PaulaReds and another local ingredient, fresh mint. Preheat oven to 350˚F. Core and peel a 1″ strip around the stem end of each apple. Place apples in a shallow baking dish. Combine raisins, brown sugar, and mint, and fill apples with this mixture. Top each with 1/2 t butter. Bake for 50 minutes or until apples are tender.